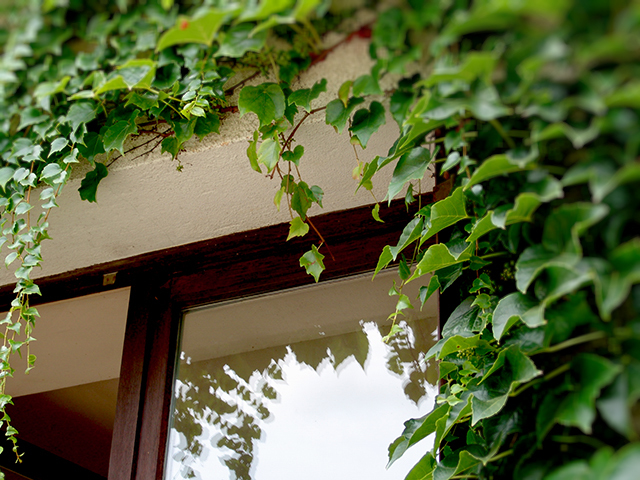 My parents were both professors at a university whose oldest buildings were clad in thick ivy. I loved entering these buildings with their gothic-arched windows and their swags of green leaves, as much a part of them as brick and mortar. I remember sitting in my mother’s large shared corner office (or was it in a turret? ), occupying myself with drawing while she worked. The professor she shared the space with, Enid, gave me sugar cubes. She was kind to me, and I loved her for it, even though her coffee-stained mug and her sturdy, orthopedic brogues scared me somewhat. I couldn’t figure out what era she’d been born in. Her spirit and face were youngish; her personal presentation was ancient. The ivy crowded around the windows on these days, shimmying in the breeze, softening the rectangular apertures that framed my view of the world outside academia, itself a sort of dream-world. It’s no wonder, I suppose, that in my adulthood, despite my dull green thumb, I have sought to surround myself with green things which climb. Up walls. Over pergolas and grilled archways. Along my porch railings. I’ve decorated the various stages and acts of my own life when possible with clematis montana, passion flower, ivy, wisteria, honeysuckle and climbing roses. I’ve learned, too, to call these plants by their names in different languages. Passiflora. Glicine. Edera. Chèvrefeuille. In France, I became acquainted with a new vine, the one I used to draw in pictures of far-away places even though I’d never seen it myself. The one that was draped over the “old house in Paris” in the Madeleine books. La Vigne Vierge. The virgin vine: up-flowing cascades of down-hanging leaves, which call to mind the grape leaf in shape, but which produce no edible fruit. Luscious, abundant, life-affirming—a cloak for dreams come true and dreams deferred—the vigne vierge clings to the walls of our house in France reminding me that even as I may grouse and grumble about my fears of failure or the economy or “what to do with my life,” many of my most important dreams have come true. The real ones. The ones about love and family and having the chance, often, to walk in the midst of beauty. And then there’s this. If our lives are filled with symbols of our own choosing—that is, things and images that are profoundly layered with meaning for us—then the vine is certainly one for me. Season in, season out, come light, come dark—it hangs on and on. Grounded, its roots go deep, even as it continues on its journey. Sometimes meandering or crooked, thwarted by obstacles. Sometimes falling. But, in the end, always and forever up. 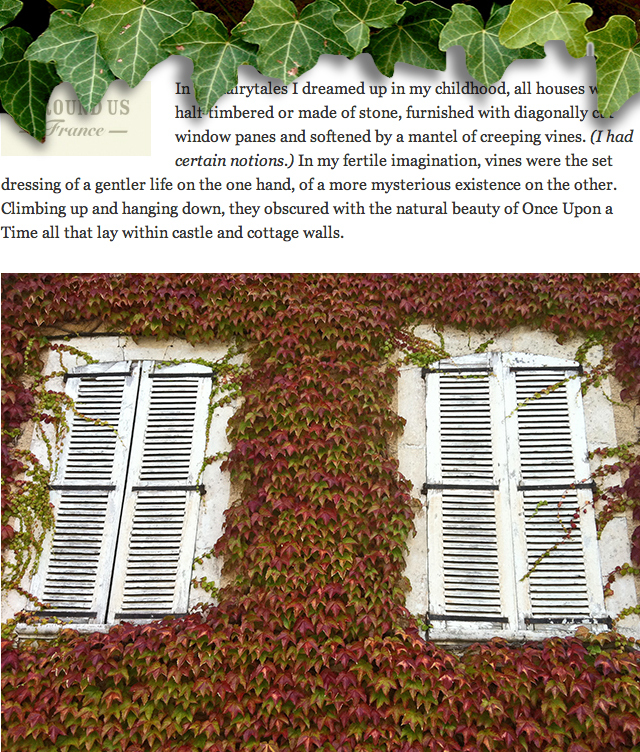 This entry was posted in AROUND US, FRANCE and tagged academia, fairytales, gardens, ivy, vigne vierge, vignes, vines. Bookmark the permalink. Really beautiful writing! And makes me think of what symbols have molded my life. Thanks Janette. That means a lot to me. i have the same fond memories of ivy and the university. 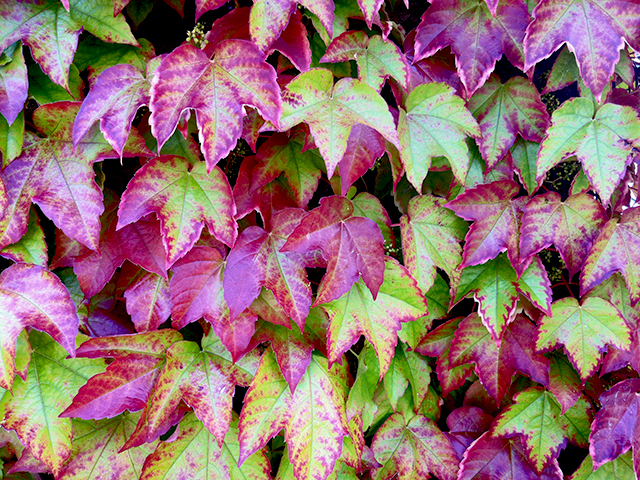 seems a university isn’t a good one – less than reliable, underachieving, not worth its salt – unless it’s ivy-covered. but in our old, established southern neighborhood, which is ivy covered, our feeling is somewhat tempered by having to keep the ivy from creeping into our doors or windows, from pulling down power cords, from killing beautiful flowering or shade trees, from destroying the equally romantic dry-stacked rock walls…… so we trim and mow and do our best to keep the relentless and destructive ivy at bay. wisteria is about to choke to death a large tree in our indifferent neighbor’s yard. i keep pulling jasmine off an electric cable going into our house. and then there’s the regular kinda ivy. ugh. 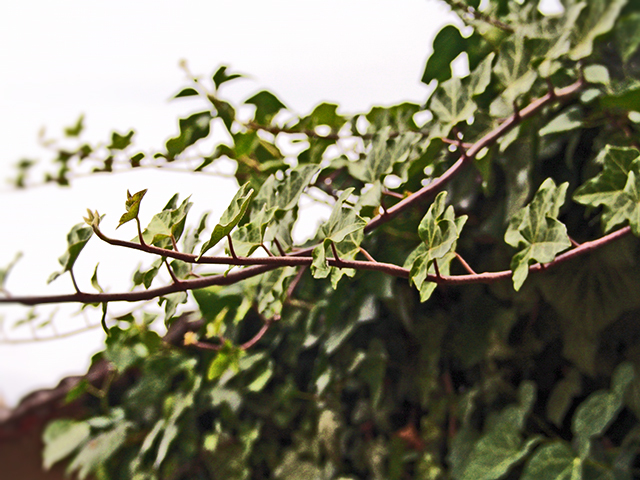 oddly enough, with the hot hot scorching weather we’ve been having lately, and more trees being cut down, allowing sun to shine directly on the ivy….the ivy’s “burning” away. 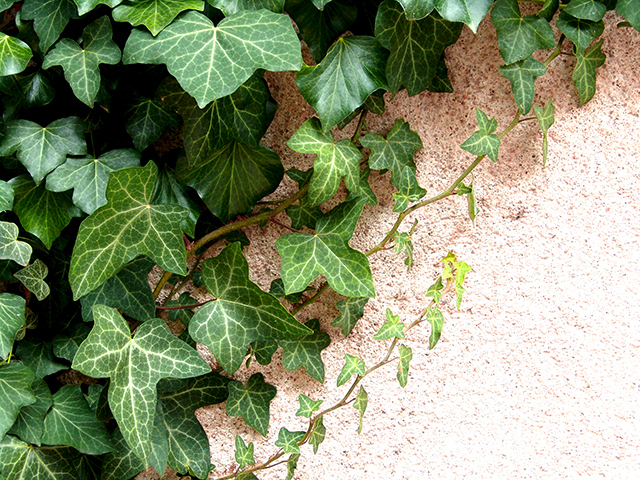 yards that used to have ivy are now looking parched, nekid (the southern pronunciation suggesting rudeness, surprise and unsexiness), mangey and unromantic. 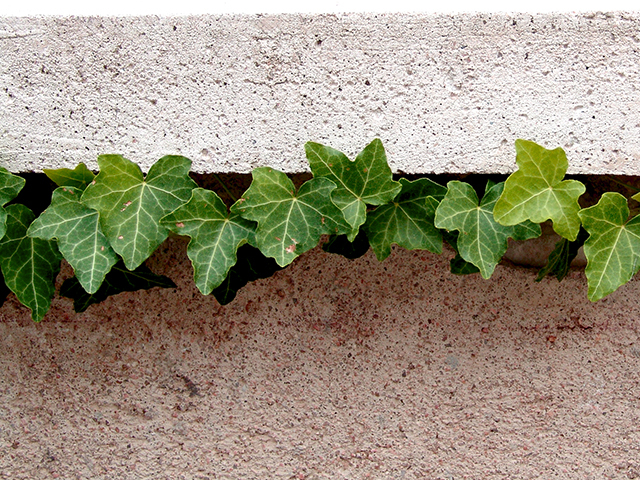 so, about this ivy stuff. we have mixed feelings. nice when it’s someone else’s, but not a fan when it’s ours.